In November of 2009, the Ventura County Watershed Protection District completed Federally-mandated engineering evaluations of nine Provisionally Accredited Levees (PALs) located within the Calleguas Creek, Santa Clara River, and Ventura River watersheds. The maps shown above depict the most currentessential levee certification project status information regarding the aforementioned nine PAL levees. The District submitted Levee Certification Report (LCR) compliance documentation packages to FEMA for three of the nine PAL-designated levees by November 30, 2009. They included: the ASR-2 Levee-Floodwall along Arroyo Santa Rosa in the Unincorporated Santa Rosa Valley, the AS-6 Levee along Arroyo Simi in Simi Valley, and the SC-1 (north half of the Sespe Creek Levee) in Fillmore. At that time, PAL-Response Reports (PRRs) were also submitted to FEMA for the remaining six PAL-designated levees. Those included: AS-7 along Arroyo Simi in Simi Valley, CC-2 and CC-3 along Calleguas Creek in Camarillo, SCR-1 along the Santa Clara River in Oxnard, VR-1 along the Ventura River in Ventura, and VR-3 in the Unincorporated Ventura River Valley. The PRRs indicated that in their then current condition, those six levees could not be certified by the District in time to meet FEMA's November 30, 2009 PAL- compliance submittal deadline date. 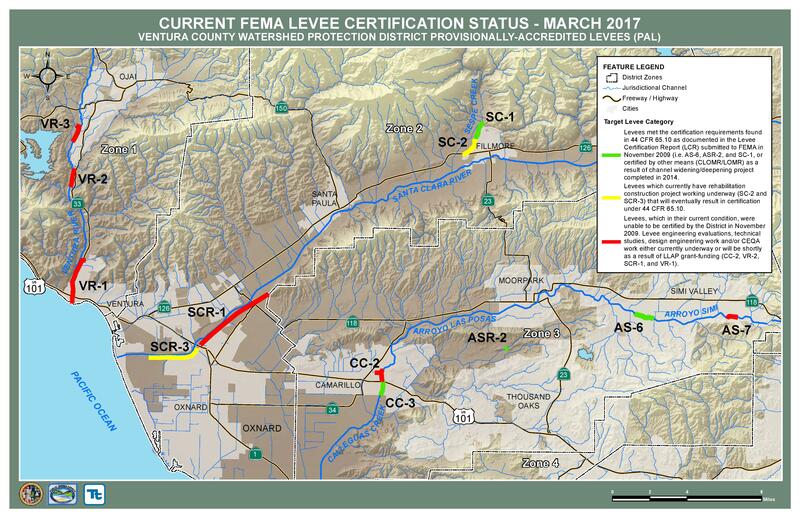 Subsequently, two additional levee systems, SC-2 (south half of the Sespe Creek levee in Fillmore) and the SCR-3 levee along the Santa Clara River in Oxnard, were added to the above list of levees requiring rehabilitation work to be fully compliant with Federal Levee Certification regulations [i.e. 44 CFR 65.10]. Construction of SC-2 levee improvements is concluding in September 2017, while SCR-3 levee Phase 1 construction is anticipated to end by December 2017. SCR-3 levee Phase 2 construction is anticipated to begin in September 2018 and end approximately two years later. The cost of each of the above two levee projects has been partly offset by Proposition 84 State Local Levee Assistance Program (LLAP) Grant funding: $2.53 million for SC-2 and $5.3 million for SCR-3. The District is currently engaged in preliminary design engineering work in support of levee retrofit and/or enhancement projects required to certify the six remaining non-certified levees in full compliance with Federal Levee Certification Requirements found in 44 CFR 65.10. In November of 2009 a planning-level estimate of the total costs required to complete the necessary levee construction rehabilitation work for all eight levees was estimated at upwards of $132 Million.. As of August 2017, VCWPD had completed approximately $40 Million of Levee Certification rehabilitation work on these levees, with an additional $20 Million programed by the end of 2020. Currently, FEMA is engaged in the process of evaluating alternative flood-risk mapping methodologies for eventual use in the determination of Special Flood Hazard Areas (SFHA) behind non-certified levees, such as the eight mentioned above. FEMA has not yet released an official date when it plans to issue new Digital Flood Insurance Rate Maps (DFIRMs) for flood protection areas behind the Santa Clara River levees. However, based on the latest information available to VCWPD, we believe that FEMA's projected release date for new DFIRMs for the areas behind the SCR-1 and SCR-3 levees might occur sometime during calendar year 2019 , at the earliest, possibly later. The District is also working closely with the United States Army Corps of Engineers, as well as affected cities, residents and property owners throughout the county to marshal Federal, State and Local funding resources necessary to complete these very important levee retrofit public safety projects. Once these levee rehabilitation construction projects are completed, the District plans on submitting Conditional Letters of Map Revisions (CLOMRs) to FEMA documenting full compliance with applicable Federal Levee Certification requirements found in 44 CFR 65.10. The District’s Levee Certification Program has been underway for ten years. At best, completion of construction rehabilitation and certification documentation for the remaining six non-certified levees will likely require at least five to ten additional years, depending on final design plans, environmental considerations, and project funding availability.